Made from the extremely soft, light, and warm fleece of goats, handwoven and often richly patterned Kashmiri (also referred to as “cashmere” in some British sources) shawls were popular in the late eighteenth and nineteenth centuries among European women who wore them as shoulder mantles. They were coverings that were both beautiful and practical; in addition to their style, they were used as covers for short sleeves and the light muslin and cotton dresses that were fashionable for the upper and middle classes. John Irwin suggested in his 1955 book on shawls that the “study of shawl-history” had “a broader interest and significance than it might at first be expected to offer,” arguing for the significance of material culture generally and shawls specifically, as a historical source. In Irwin’s telling, luxurious shawls were brought to Europe in the late eighteenth century and were made fashionable by elite wearers, the only people who could afford their very expensive price tags. They grew in popularity, which encouraged the development of technological innovations to allow British manufacturers to create a “vulgar” version of lesser cost and quality. Irwin argues that the 1870s “marked the eclipse of the shawl as an article of fashion in the West,” or at the very least, “as a luxury fashion only, for one of the factors which contributed to its abandonment in upper class circles was undoubtedly its increasing popularity among the lower classes.” This story of the “rise and fall” of the Kashmiri shawl as a fashion item in the nineteenth century, pioneered by Irwin and subsequently confirmed by others, has been the dominant understanding of the history of the Kashmiri shawl and its interactions with Europe. One recent work, for example, confirms the shawl was “utterly devalued as fashion” by the 1870s.This suggests, however, that fashion is exclusively an elite phenomenon. That is, when the upper classes abandon a particular item, it can no longer be considered “fashion.” However, as Beverly Lemire points out, by the end of the eighteenth century, “popular fashions of all descriptions had become a fixture of British economic and social life,” and as a result, obvious divisions of dress between social ranks were less distinct. Fashion was important to all levels of society, and was integrated into the economy and cultural life. The cost of fabric decreased with the development of new manufacturing techniques, and varied wardrobes became available to the growing middle classes and even to some of the working classes as “Sunday Best.” Scholars have argued that fashion was democratized by the late nineteenth century, due in part to the wide distribution of fashion through mass market periodicals and the increasing availability of ready-made clothing in department stores. As such, rather than utilize the “rise and fall” narrative to understand the trade, consumption, and eventual British production of shawls, one can extend the definition of “fashion” to include the use and embrace of shawls outside of the elite market, and thus, beyond the 1870s. This is not to dismiss the central role of the elite in fashion in the nineteenth century, but rather to suggest that the notion of “fashion” and concern with style can be expanded to include other classes as well.In addition to expanding the notion of fashion, a consideration of the evolution of the shawl during the eighteenth and nineteenth centuries may also be useful in thinking through the concept of “luxury.” In her book Luxury and Pleasure in the Eighteenth-Century Britain, Maxine Berg argues that in the period from 1760 to 1820, patterns of worldwide trade led to a revolution in consumption. This, in turn, encouraged the development of British manufacture goods, which emulated and copied the luxuries brought to Britain from around the world. Luxury items, bought because they were desired, not needed, and “sold as part of the economy of quality and delight,” were purchased by the burgeoning middle classes, from industrialists to ordinary tradespeople. Jan de Vries echoes Berg, arguing that a “New Luxury,” engendered by urban dwellers “striving for comfort and enjoyment, lent itself to multiplication and diffusion.” This kind of luxury was used not to differentiate between classes, but demonstrated shared cultural understandings and created sociability between consumers. Key to this new consumer luxury was the variety and quality of goods from the “Orient” and their connection with the exotic. The desire to imitate the aesthetic qualities of these exotic goods and provide more affordable alternatives led to domestic product development and industrial innovations. As these types of products proliferated, distinctions between luxury as lasting and fashion as ephemeral began to shift, and products were created that were both emulative of the originals and unique enough to be special. Goods such as shawls were seen to be exceptional and exotic, and therefore associated with luxury, but they also became part of fashion cycles more generally, which both created and supported further demand. Like the Indian calicos Berg uses as an example, then, shawls were part of an interaction between fashion and luxury that was not distinct, but mutually reinforcing. This paper is intended to examine, and to further complicate, the understanding of the language used to describe both the Kashmiri industry and the British industry that arose from it, and to explore the ways that the Kashmiri shawl and its British counterparts embodied and expressed the growth of luxury, the development of fashions, and the tensions of colonialism. In examining shawls, one must attempt to avoid, as Michelle Maskiell points out, the “naturalization of the violence enabling colonial possession of shawl design as well as the earlier possession of Kashmiri shawls as trade goods.” Certainly, one can see a familiar pattern whereby eastern goods were monopolized, copied, and incorporated in European fashion. Yet, as Barry Crosbie and Mark Hamilton point out, “the cultural British world … should be seen neither as something that is constructed hegemonically from above nor rising reactively from below, but rather as an arena of mutually reinforcing mobility and exchange.” The nineteenth-century British discourse about shawls of both Kashmiri and British origin links them with newly available luxury and their exotic and colonial roots, rather than recounting the simple story of their “rise and fall” in upper-class fashion. Shawls and their consumption were not limited to a certain time, place, or class, but had complicated (and sometimes contradictory) cultural meanings, and therefore can be understood as part of a “language” of fashion, luxury, and empire that was widely used and understood. Kashmiri shawls, originally produced in the Kashmir valley in the northern part of the Indian subcontinent, had a long history as both a trade good and as a luxury item prior to their popularity among women in Europe. The use of shawls as gifts between leaders indicate their value and longstanding status as luxury goods, as seen in records of woolens consistent with Kashmiri shawls sent from India to the ruler of China in the 1330s. In the fifteenth and sixteenth centuries, shawls and shawl materials travelled far beyond India, and the trade of Kahsmiri shawls with Asian and African areas exceeded those with Europe through the eighteenth century. As such, the trade with Europe was an extension of a much longer, well-established use of the shawl as a trade and gift item with an understood value. As fashionable items, Kashmiri shawls are referenced in a variety of places and with different uses. Kashmiri fabric was “wound as men’s turbans in Egypt, stitched into wealthy Iranian women’s jackets, prized for men’s coats in Turkestan, worn as sashes in Tibet and gifted to both ‘dancing girls’ and male nobles from Dehli to Istanbul.” In her book, Pashmina: The Kashmir Shawl and Beyond, Janet Rizvi reports that “shawl fashion seems to have caught on as early as 1795” in Russia. She quotes a visiting artist who notes that there was “no shortage” of “cashmere shawls” in St. Petersburg, and alludes to their use as props in amateur theatrics. The use of Kashmiri fabric in various ways, including to create clothing and as an item of clothing in itself, worn in differing manners and by both men and women, shows its evolution and adoption as fashion in a variety of contexts. Kashmiri shawls likely made their way to Britain in the latter half of the eighteenth century, as luxury gifts from returning East India Company employees. Shawls identified as Kashmiri-style can be found in British art as early as 1780. Their inclusion in portraits is a signal of their importance: women, and the artists who painted them, included the fabric in striking ways, and often in painstaking detail. Intended to perhaps indicate the status or the wealth of the wearer, similar to wearing a large piece of jewelry in a portrait, or to show their awareness and possession of luxurious object, the inclusion of the shawls in portraits speaks to their presence in European material culture more broadly. A widely circulated engraving of Princess Charlotte of Wales in 1817 (Fig. 1) prominently displays her at the theater wearing a Kashmiri shawl, a striking red and patterned garment, set against the white of her gown and the flowers in her hair. The shawl was associated here, then, with royalty and with a fashionable night out in the company of a handsome young man. Portraits by Jean-Auguste-Dominique Ingres from the early nineteenth century (for example, Fig. 2) featured the shawls prominently in settings that are otherwise relatively simple, emphasizing their texture and pattern, as well as their exoticism and luxury. The drape and volume of the fabric in these portraits is highlighted with a flowing style, which associates Kashmiri shawls with the physical experience of wearing them, both in terms of their striking and unique beauty, and their sensuous and luxurious feel. Further, like other Indian fabrics, they were understood as luxuries not only because they were imported, but also because of their eye-catching color and rich fabric, qualities made visible through their representation in these portraits. Left: Figure 1. William Thomas Fry, after George Dawe, Princess Charlotte Augusta of Wales; Leopold I, King of the Belgians, 1817. Colored engraving. National Portrait Gallery, Accession number NPG 1530. © National Portrait Gallery, London. Right: Figure 2. Jean-Auguste-Dominique Ingres, Portrait de Madame de Senonnes, 1814. Oil on canvas; 106 cm x 84 cm . Musée des Beaux-Arts de Nantes. In Europe, Kashmiri shawls came to be seen as a desirable investment; they were often used as wedding gifts and as part of an inheritance. Still, imported Kashmiri shawls remained limited in their distribution, as genuine shawls cost between seventy and one hundred pounds each in the early part of the nineteenth century, which limited their market to the elite. As early as the 1770s, however, British imitations of Kashmiri shawls began to appear, produced first in Edinburgh, then in Norwich, and then most significantly, in Paisley. Paisley came to dominate the British shawl trade—the name of the town even became synonymous with the “pinecone” patterns that were originally associated with Kashmiri shawls and were subsequently appropriated and imitated by British manufacturers. Various materials, production tools, and designs were used to produce the most desirable shawls possible, and the process and its products were in “constant flux.” Using new technology, like the Jaquard loom, and printing patterns rather than weaving them, British manufacturers were able to bring prices down. In the 1810s, the least expensive British-produced shawls sold for about twelve pounds each, and later, by the late 1850s, for between 17 shillings and 27 shillings each. Here, one sees the implementation of the imitation, which led to the creation of new products and processes. As Berg observes, the “middling classes, lesser gentry and urban consumers took delight in such fine consumer goods; they first imported them, then produced their own adapted and imitative versions.” As goods became more affordable—especially those versions that were not handwoven, Jaquard woven, or printed—shawl production in Britain extended the fashion and consumer demand for exotic and luxury goods to the middle and then lower classes. Shawls were discussed and referenced in a variety of popular and widely available cultural sources, including novels, diaries, and periodicals. These references both construct and reinforce the meanings and language of shawls. They confirm the fascination with exotic and imperial goods, and highlight the shawl’s status as an object of desire and a matter of fashion. At the same time, the advancement of British manufacture of shawls was described as a matter of “patriotic pride.” The shawl was a language to itself: one that was recognized not just by those viewing elite portraits, but also transmitted throughout society in popular culture. Frequent passing references demonstrate the variety of meanings associated with shawls. For example, in an 1833 interview with the “mother of Napoleon” from the Oriental Observer, the author noted she was “dressed in robe of rich dark grey satin, a bonnet of the same material, worn over a lace cap … A superb Cashmere shawl, that looks like a tribute from some barbaric Sovereign, fell gracefully over her shoulders.” The reference to “superb Cashmere” evoked luxury, and associated the covering with French aristocracy in a similar manner to the engraving of Princess Charlotte at the theater. Awareness of the shawl as an object of gifting between leaders and the “exotic” was suggested by speculating about its origins as “tribute.” Shawls were also used in tales of theft, showing that their value was perhaps seen as similar to jewelry. “Adventures of a Cashmere Shawl” from the Morning Post in 1841, for example, reported a robbery during which a valuable shawl was stolen from a military wife. The shawl’s status as a valuable luxury item and object of desire was thereby reinforced and disseminated to readers of the article. We have now reached the shores of Asia, and how new and un-European is all here! The narrow, crowded streets, filled with people in the curious Eastern costumes: some in long flowing robes, white turbans, yellow or red shoes, and their leathern girdle, or rich cashmere shawl, acting as girdle, stuck round with pistols, and daggers, and knives, their purses, & etc. The shawl here was part of a scene of exoticism, strangeness, and luxury. Further adding to the foreignness, the wrap was worn by a man to hold weapons around his waist, transforming an object that the reader would be familiar with into one that seems strange, and even perhaps threatening. It served to “other” the scene and emphasize its exoticness. E. Augusta King also used the charged language of the shawl in her Diary of a Civilian’s Wife, published in 1884. She employed shawls as tools to evoke the exotic in her surroundings and to comment on consumption practices. On visiting Kashmir, she wrote that her party “saw some of the famous Kashmir shawls, but steeled [themselves] against being tempted by them.” This passing reference indicated that the shawls were well known, and that they were still seen, at least by a middle-class woman who had spent several years away from the metropole, as desirable objects of luxury and fashion. Rather than the extreme “fall” from fashion conceived by Irwin, the shawls were still “famous” to King, something she must resist purchasing, and representative of the exotic, which her metropolitan readers would recognize and associate with their understandings of the Empire and the broader world. King also evoked the “pinecone” pattern of shawls to illustrate the beauty of her surroundings. She referenced the “famous shawl pattern” to describe the winding path of a river, whose “circular curves” were “so beautiful to look at” and were “said to have given the idea” for the design of the shawls to “Kashmir work-men.” The shawl was evocative of nature, and its beauty and meanings were well known enough to serve as a reference for a metaphor. King used the “paisley” pattern, made familiar by the extension of shawl production and fashion beyond a small elite, to describe the geography of empire directly. 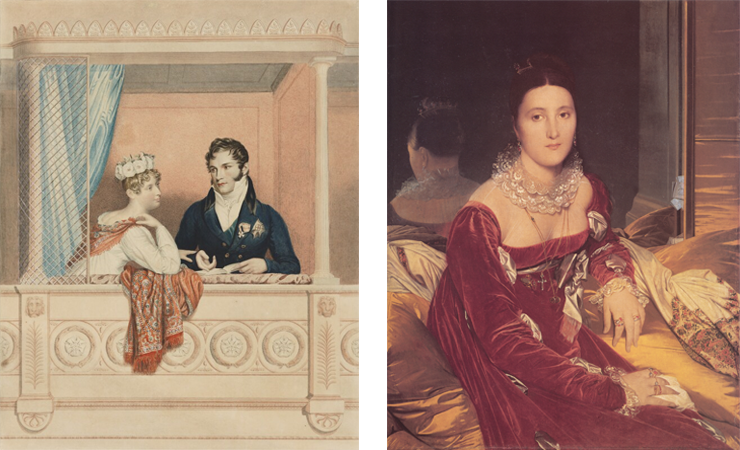 Articles such as “Cashmere Shawls,” found in The Lady’s Newspaper and Pictorial Times in 1848, show the prominence of the shoulder mantle as a fashion item and its ubiquity as a cultural reference. By asking “What lady does not wish for a cashmere shawl?” the article set up the shawl as the perfect gift, stating “every lady who has a father, uncle, brother, or cousin, it matters not how far removed, makes either a direct and pressing request, or else gives hints, so broad as cannot be mistaken, for the possession of the much-coveted shawl.” The idea of the shawl as a perfect gift was echoed in a narrative called “Punch’s Code for Husbands and Wives” featured in Punch. It suggested that wives should “devote the entire day to shopping, in buying gloves, handkerchiefs, comforters for him; and if, in return, he should force upon you a beautiful cashmere shawl you have casually admired, oblige him by all means, and accept it.” This unsubtle encouragement of consumerism supported the shawl’s status as an object of desire and a luxury, a want rather than a need, and reinforced its significance as a fashion item, suggesting women purchase one (or request one as a gift from a man). We confess that we have seen many shawls of our own Paisley manufacture far more beautiful in colour and in design that the greater number of those from Cashmere; but then the material, nay, there we must confess the inferiority. A similar balancing act can be found in an article attributed to Harriet Martineau published in Dicken’s Household Words in 1852. Martineau wrote extensively on the British Empire and imperial subjects, though she never travelled outside the British Isles. Zutshi argues that Martineau’s narrative is valuable for its response to “critiques of the British imitation shawl by design purists, since their responses embodied anxieties about British industrial dominance in the context of the imperial economy.” Nineteenth-century debates over the problem of design copyright and piracy led some to obliquely acknowledge the “fact of … indebtedness” to Indian products, as they provided the impetus to new manufacture and design techniques. Responses like Martineau’s suggested that the innovation of new manufacturing techniques meant that domestic versions had the potential to outshine the originals. This served to sanction the purchase of an imitation shawl as a respectable alternative to the imported version, for middle class women who could not afford the original. Though she acknowledged that the Kashmiri shawls were still the softest and the most beautifully patterned, despite “all our Schools of Design and study of nature and art,” Martineau also argued that British shawls were “genuine and venerable” like the Kashmiri shawls. She emphasized their modern and industrial production, in contrast to the supposedly antiquated methods of the Kashmiri weavers. The piece goes on at length about the techniques for making the various kinds of imitation shawls, detailing the process and method of production, and showcasing their ingeniousness and innovation. Martineau’s article made the connection between shawls and the exotic evident as well, invoking both faraway places and the world of empire by conspicuously alluding to the “harem” and to Eastern princes as “wild beasts.” In this, she was “mapping the difference” and showing “the ways in which colonised peoples were categorised and placed in the British imagination.” Exotic goods like shawls from the East, and British manufactured goods thus were connected in the imagination of potential consumers in the metropole. In particular, one can see through this discourse the “role of cross-cultural consumption within the generation of national identities” whereby, in this case, goods that were Indian, or at least inspired by Indian goods, become “so very ‘British.’” Through her semantic acrobatics, Maritineau’s conflation of the Kashmiri shawls with the British versions served this purpose. The shawl, then, had several meanings: it was accessible and luxurious, for the wealthy and for the poor (and even for the dissolute), and exotically Eastern and comfortably British. Martineau emphasized the themes of accessibility and fashion later in the narrative. She pointed out, “the most devoted worshippers of the genuine shawl can hardly wonder [at the rise of the least expensive Paisley printed shawls], considering the love of change that is inherent in ladies who dress well, and the difference of cost.” An argument familiar to us in the era of “fast fashion,” she suggested that while a Kashmiri shawl “lasts a quarter of a lifetime,” a printed shawl “will last two years; by the end of which time, the wearer has in mind something new.” Not only can one wear a Paisley shawl with “pride,” one can also keep up with the latest shifting fashions without guilt, as the imitation shawls simply did not last as long. Thus, rather than purchasing a “vulgar” inexpensive copy that did not last as long as it should, buyers of the printed British shawls were offered the opportunity to shop again and to keep up with any changes in fashion. The production of such an article [a Kashmiri shawl] is an event in life; while here, at Paisley, if the pattern requires months, the weaving of the most genuine and venerable kind occupies only a week. We do not believe that the simple and patient Oriental will be driven out of the market by us, because there is no promise, at present, of our overtaking their excellence. We hope there will be room in the world of fashion for them and us for ever … We shall not go back to their methods, and it is not very likely that they should come up to ours; so we shall probably each go on in our own way, which is what everybody likes best. Here again, Martineau pointed out how fashionable shawls are, and the differences in the manufacturing processes, both complimenting the “genuine” shawls and condemning their methods of production as backwards, arguing that Kashmiri weavers will not “come up” to the new British processes for weaving. There was little acknowledgement, however, of the debt the British shawl industry owed the Kashmiri weavers directly. The article was unapologetic of the imitative process of making shawls in Norwich and Paisley, which were perhaps not as lovely as the Kashmiri shawls, but allowed more women to enjoy them, thus democratizing fashion. In an indirect acknowledgement of the market dynamics that the British processes upset, Martineau argued that the larger production capacity of the British manufacturers would not threaten the weavers of Kashmir. Here, she undid her earlier conflation of the two products. Kashmiri and British producers were making different products for different markets, and the immense popularity of shawls, as she described when talking about the large number of women who wore shawls earlier in the piece, would allow all to flourish, in different ways and at different scales. The difficult dynamics of colonialism and the effects of trade and imperialism are thus reflected in her language for shawls. Left: Figure 3. Shawl, University of Alberta Clothing and Textile Collection, accession number 1999.50.1. Photo courtesy the author. Right: Figure 4. Detail of shawl, University of Alberta Clothing and Textile Collection, accession number 1999.50.1. Photo courtesy the author. Martineau’s argument is mirrored in an object from the Clothing and Textiles collection at the University of Alberta, designated as a “Norwich Shawl in Kashmir Style,” and dated in the object’s collection file to 1825. The shawl is large, almost 10 feet in length and 4.6 feet wide (Figs. 3 and 4). It is finely woven with a cream ground, and a largely blue pattern with red and green accents. 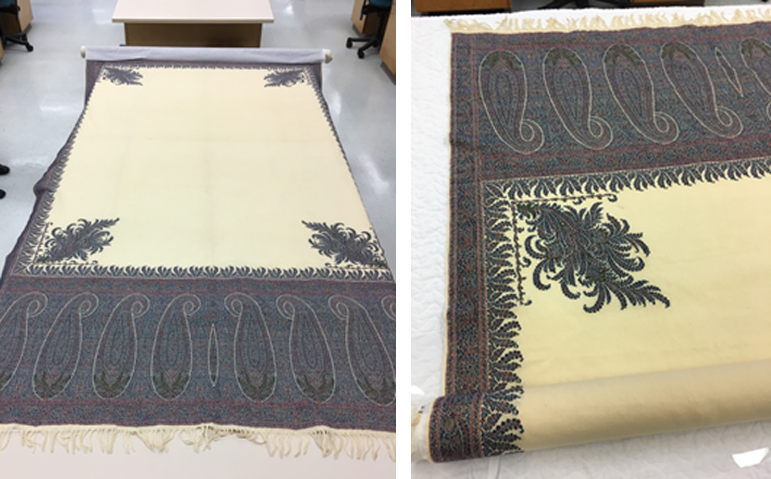 The preservation and subsequent donation of the shawl speaks to the meaning and significance of this “imitation” shawl to its owner despite its not being “genuine,” blurring the boundaries between expensive Kashmiri shawls and British produced imitations, as Martineau does. Little is known about the shawl’s provenance. The donation notes only state that it was received from the donor’s maternal grandmother, who was born around 1870 and brought to Canada in 1910. The donor believed that it was never worn in Canada, and indeed, it shows very little evidence of wear at all. Though the use and attendant meanings of the Norwich shawl are not known definitively, we can conclude from the donor’s information about her grandmother’s date of birth that it was either purchased or given to her as a gift after 1870. This suggests that it was still seen as valuable, and perhaps fashionable, after the “fall” of the shawl according to Irwin, in the 1870s. The shawl was saved in pristine condition, brought to Canada, and later given to a granddaughter as a store of memory. This shawl, then, was significant enough to its owners to be saved and cared for. If the 1825 date of manufacture is correct, its owners, of which there were at least two and possibly more, seem not to have rejected it as a lesser version of an elite Kashmir-produced shawl, but as Martineau suggested, it was perhaps a “symbol of woman’s taste and condition” and hence a valuable commodity. The shawl is strikingly similar to the “kirking shawl” displayed in Rizvi’s book, Pashmina. Such shawls “enabled women of the middle and lower class to adopt the fashion” of Kashmiri-style shawls. Rizvi suggests that “in mid-century Scotland, every bride from a family with any pretensions to gentility received as part of her trousseau a ‘kirking shawl,’ in a style derived from the classic Kashmiri doshala, with plain white field and deep sober-coloured pallavs woven in a buta (‘pinecone’/‘paisley’)-based design.” The shawls were worn to church (kirk) on the “first Sunday after her marriage.” The story Rizvi tells of the kirking shawl echoes Martineau’s “farmer’s daughter,” who buys a shawl for her wedding. Both examples hint at the potential for meaning that such a wrap may have had for its owner, as a luxurious item worn for a wedding or other special occasion, not worn regularly, but saved for future generations. Kristina Molin Cherneski is a PhD student in History at the University of Alberta, where she specializes in 19th-century Britain. She holds BAs in History and Political Science from the University of Alberta, a master’s degree in Public Administration from Queen’s University (Canada) and a master’s degree in History from the University of Oxford. As Michelle Maskiell points out, these shawls (and the area from which they originated) were also known as “cashmere.” In the eighteenth and nineteenth centuries, these terms seem to be used interchangeably when referring to British and Kashmir produced shawls. Shawls of various and often ambiguous origins are frequently and confusingly called “Indian shawls” in contemporary use as well. Michelle Maskiell, “Consuming Kashmir: Shawls and Empire, 1500–2000,” Journal of World History 13, no. 1 (2002): 27–65. Janet Rizvi, Pashmina: The Kashmir Shawl and Beyond (Mumbai: Marg Publications, 2009), 221; Nupur Chaudhuri, “Shawls, Jewelry, Curry and Rice in Victorian Britain” in Western Women and Imperialism: Complicity and Resistance, ed. Nupur Chaudhuri and Margaret Strobel (Bloomington, IN: Indiana University Press), 233. John Irwin, Shawls: A Study in Indo-European Influences (London: Victoria and Albert Museum / Her Majesty’s Stationary Office, 1955), 1. Other prominent histories of shawls tell a strikingly similar story, including: Monique Lévi-Strauss, The Cashmere Shawl (London: Dryad Press Limited, 1987); The Kashmir Shawl (New Haven, CT: Yale University Press, 1975); Grace Beardsley, Wrapped in Beauty: The Koelz Collection of Kashmiri Shawls (Ann Arbor, MI: University of Michigan, 2005). Suzanne Daly, The Empire Inside: Indian Commodities in Victorian Domestic Novels (Ann Abor, MI: University of Michigan Press, 2011), 34–35. Daly takes this example from the upper-class characters in an Oscar Wilde play, continuing Irwin’s understanding of “fashion” as synonymous with upper-class consumption. Sandra Niessen argues that this is the conventional theorizing of “fashion.” See Niessen, “Re-orienting Fashion Theory” in The Fashion Reader, 2nd edition, ed. Linda Welters and Abby Lillethun (Oxford: Berg, 2011), 151. Beverly Lemire, Fashion’s Favorite: The Cotton Trade and the Consumer in Britain, 1660–1800 (Oxford: Oxford University Press), 200. Susan North, “From Neoclassicism to the Industrial Revolution: 1790–1860” in The Fashion Reader, 2nd edition, ed. Linda Welters and Abby Lillethun (Oxford: Berg, 2011), 53. Cynthia Cooper, “The Victorian and Edwardian Era: 1860–1910” in The Fashion Reader, 2nd edition, ed. Linda Welters and Abby Lillethun (Oxford: Berg, 2011), 69. Jan de Vries, “Luxury and Calvinism / Luxury and Capitalism: Supply and Demand for Luxury Goods in the Seventeenth-Century Dutch Republic,” The Journal of the Walters Art Gallery 57 (1999), 74. Berg and Chitralekha Zutshi, “‘Designed for eternity’: Kashmiri Shawls, Empire, and Culture of Production and Consumption in Mid-Victorian Britain,” Journal of British Studies 48 (April 2009), 420–440. Barry Crosbie and Mark Hamilton, introduction to The Cultural Construction of the British World, ed. Crosbie and Hamilton (Manchester, UK: Manchester University Press, 2016), 14. Another assumption made in Irwin’s work is addressed by Frank Ames in Woven Masterpieces of Sikh Heritage, where he takes issue with the chronology of shawl design and decoration that Irwin sets out, which he argues “has a tendency to remain fairly limited in its global purview.” As a result, Irwin perhaps incorrectly perceives a “progression” in the designs, rather than concurrent and spontaneous changes and therefore may be dating shawls incorrectly. Frank Ames, Woven Masterpieces of Sikh Heritage: The Stylistic Development of the Kashmir Shawl under Maharaja Ranjit Singh, 1780–1839 (Woodbridge; Suffolk, UK: Antique Collectors Club, 2010), 35–41. Zutshi suggests that the shawl became “an essential fashion accessory” at the “turn of the nineteenth century.” Zutshi, 423. Berg, 71. The prices of shawl included here and on following page are included to show the decline in prices over time as production methods changed. The present value of prices such as these is complicated to determine, as discussed at https://www.measuringworth.com/. The site also provides several tools for determining a present value for these amounts and explanations of their meanings. “An Interview with the Mother of Napoleon” Oriental Observer, Calcutta, 13 April 1833. “Adventures of a Cashmere Shawl” Morning Post, London, 18 March 1841. “First Impressions Abroad: Notes from a Lady’s Journal,” The Lady’s Newspaper and Pictorial Times, London, 10 September 1859, 217. Further, the shawl was worn here in one of the many ways it was worn before becoming known in Europe as a shoulder mantel for women. It is a waist decoration for a man, highlighting a “discourse of gender” that exposes “systems of cultural appropriation” in the use of textiles. See Cheang, 223. E. Augusta King, The Diary of a Civilian’s Wife vol. 2 (London: Richard Bentley and Son, 1884), 196. “Cashmere Shawls,” The Lady’s Newspaper and Pictorial Times, London, 29 January 1848. Interestingly, a husband is missing in the list of possible gift givers. The author goes on to refer to “Parisian ladies” who might be “induced to yield a hand to a lover who unexpectedly proffered for acceptance a Cashmere shawl.” The relationship between propriety, gift giving, national identity, and male-female relationships here is striking, but unfortunately out of the bounds of this paper. “Punch’s Code for Husbands and Wives,” Punch, London, 18 October 1845. Harriet Martineau, “Shawls,” Household Words, London, 28 August 1852, 552–556. Attributed to Martineau by Zutshi and Dickens Journal Online (http://www.djo.org.uk/). Catherine Hall, “Imperial Careering at Home; Harriet Martineau on Empire,” in Colonial Lives Across the British Empire: Imperial Careering in the Long Nineteenth Century, ed. David Lambert and Alan Lester (Cambridge, UK: Cambridge University Press, 2006), 335. Lara Kriegal, “Culture and the Copy: Calico, Capitalism, and Design Copyright in Early Victorian Britain,” Journal of British Studies 43 (April 2004), 262–263. Debates about design and Indian decorative art in the Aesthetic Movement in the Victorian period are also examined by Partha Mitter, Much Maligned Monsters: A History of Reactions to Indian Art (Oxford, UK: Oxford University Press, 2013). Hall, 335. Hall goes on to remind us that “these ‘mappings’ were never fixed, always mobile and contested, subject to changes, whether associated with events across the sites of empire (India in 1857…) or ‘at home’ (the growth of scientific racism…).” Hall, 335–336. Sarah Cheang, “Dragons in the Drawing Room: Chinese Embroideries in British Homes, 1860–1949,” Textile History 39, no. 2 (November 2008), 223. Cheang looks at Chinese textiles used in domestic environments, but her insightful observations seem apt here as well. Norwich Shawl in the Kashmir Style,” Accession number 1999.50.1. University of Alberta Clothing and Textile Collection, Edmonton, Alberta, Canada. Dated by donor’s information. Information provided by donor at time of donation and contained in the object’s collection file at the University of Alberta Clothing and Textile Collection.